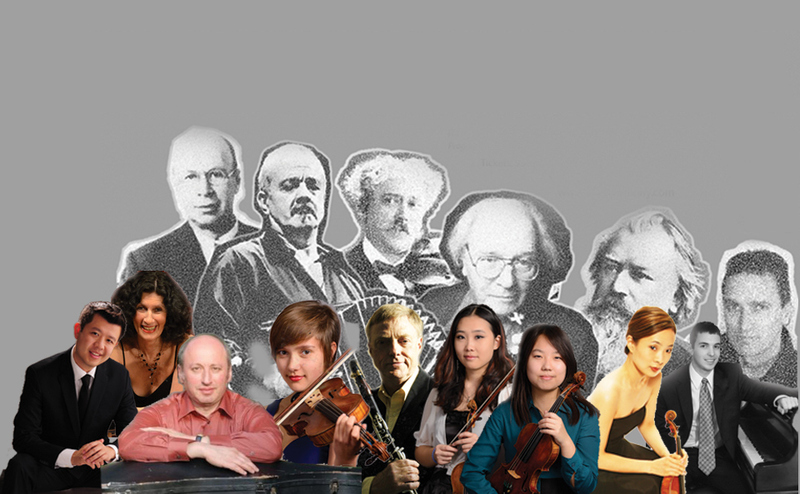 A musical meeting of Johannes Brahms, Astor Piazzolla, Olivier Messiaen, Sergei Prokofiev, Claude Debussy, Sergei Rachmaninoff and Pablo de Sarasate is scheduled for April 25 at Weill Recital Hall, when InterHarmony International Music Festival performs a series of mostly short chamber and solo works by the masters, as well as a world premiere by Nigel Keay. 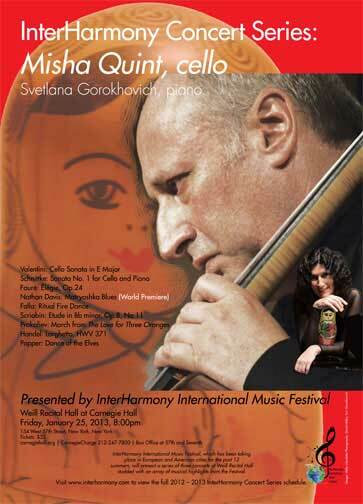 The concert marks InterHarmony's third and final concert at Weill this year. 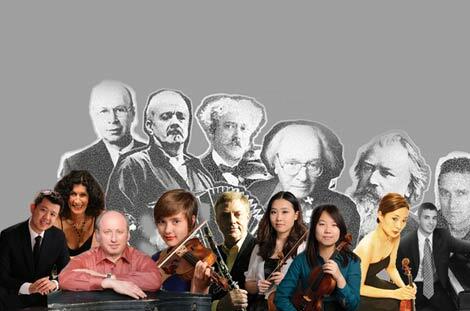 The program of diverse works was designed by cellist Misha Quint to challenge the musical versatility of the musicians, a mix of advanced, award-winning young artists and faculty from the InterHarmony Festival, which Quint founded 14 years ago. 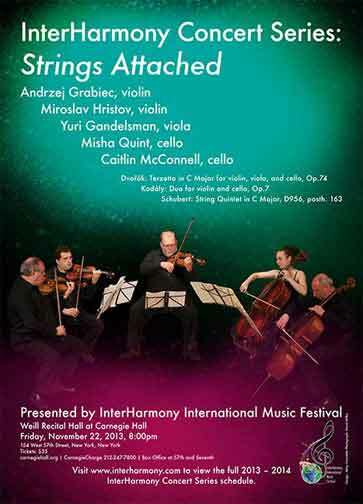 The performers, all virtuosic musicians, include InterHarmony artist faculty members Ning An, piano; Eugenia Choi, violin; Svetlana Gorokhovich, piano; Howard Klug, clarinet; and Misha Quint, cello. The upcoming musical stars are Clarice Collins, violin; Carson Hayes, piano; Xiangyuan Huang, violin; and Shu Liu, violin. Showcasing a lyrical and tender side of Olivier Messiaen, "Theme and Variations" was composed in 1932 as a wedding gift for his first wife, the violinist and composer Claire Delbos. Conventionally based, it is one of the most significant of Messiaen's early works, representing the compositional techniques he had developed at that point in his career. It provoked Pierre Boulez, coming to the music at a chance hearing, to exclaim: "It was enough to inspire me with an immediate wish to study with him. I felt the force of his attraction immediately, as I say, at a single hearing." Brahms's "Clarinet Trio for clarinet, cello and piano in A minor, Op. 114," is one of two works inspired by Brahm's introduction to the musical brilliance of clarinetist Richard Muhlfeld. The trio, premiered in Berlin in December, 1891, was described by Eusebius Mandyczewski, a scholar and friend of Brahms, as "it is as though the instruments were in love with each other." Prokofiev's "Sonata for Two Violins, Op. 56," begins with a dark, Slavically lyrical first movement, which transforms to a fast, raw, fiercely dramatic second movement, before turning into a tender and simple third, and concluding with a blazingly fast coda. The April 25 program includes three works grounded in ethnic dance forms: Pablo de Sarasate's "Introduction and Tarantella, Op. 43," during which dancer and instrumentalist demonically challenge each other's energy, and Astor Piazzolla's "Tango Suite," a blend of elements of jazz and classical music. Composer/violist Nigel Keay, a New Zealand native, now living in Paris, created his "Tarantella," a world premiere, for violin and piano. A work for solo piano, Debussy's "Poisson d'Or, " (Goldfish), composed in 1907, was inspired by a painting of a darting goldfish on a Japanese lacquer panel in the composer's study. In less than four minutes, the music moves from playful to a darker, more intense, almost violent state of mind. Rachmaninoff's "Etudes-Tableaux in E Flat minor, Op. 39, No. 5" challenges the virtuosity of its pianist, demanding unconventional hand positions, wide leaps for the fingers and extraordinary technical stamina. Pianist Ning An has been hailed by the New York Concert Review as a musician who "combines a flawless technique and mastery of the instrument with an expressive power that is fueled by profound and insightful understanding." His top prizes from the Queen Elizabeth, Cleveland, and William Kapell Piano Competitions led to performances from Carnegie's Weill Recital Hall, Salle Verdi (Milan), to the Great Hall of the People in Beijing, China. He has been invited to perform at numerous festivals, including the International Chopin Festival in Poland, the Gina Bachauer Piano Festival in Salt Lake City, New Hampshire's Monadnock Music Festival, the Bourglinster Festival in Luxembourg and the Interlaken Music Festival in Switzerland. A passionate chamber musician as well as soloist, An has performed with groups such as the Ysaye, Daedalus, and Takacs Quartets as well as instrumentalists James Buswell, Paul Neubauer, Andres Diaz and Soovin Kim. 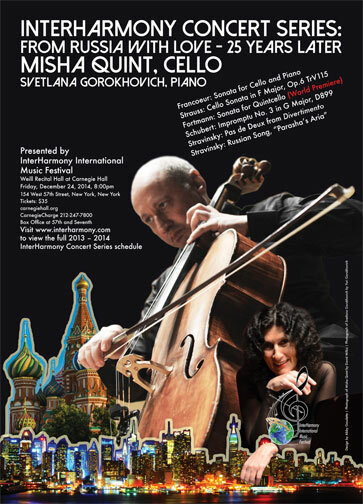 Pianist Svetlana Gorokhovich has performed in international music festivals in Holland, Germany, Italy and New York. She has worked with Misha Quint since 2005. Her latest performances include recitals in Zankel Hall, Weill Recital Hall and Ridotto Music Series. Gorokhovich received her music training in the Kazan State Conservatory and her Ph.D. from St. Petersburg State Conservatory, studying with distinguished professor Tatiana Kravchenko. She immigrated to the U.S. in 1989. Gorokhovich was the 1997 winner of the Bartok-Kabalevsky- Prokofiev International Piano Competition at Radford University and the 1999 IBLA international competition in Italy. Her solo recital at Carnegie Hall in 2000 was highly acclaimed by the New York Concert Review. Her most recent recording, "One Piano Four Hands," was released in 2012 by SMH Records. She toured world-wide with violinist Dmitri Berlinsky from 1991 –1996. Their recording, "Souvenir D'un Lieu Cher" (Helicon), released in 1997, received enthusiastic reviews. Gorokhovich is on the piano faculty of the Music Conservatory of Westchester in White Plains, New York. Clarinetist Howard Klug is Professor of Clarinet in the Jacobs School of Music at Indiana University, Bloomington. A former member of the US Air Force Band in Washington, D.C., where he was a featured soloist on flute, clarinet and saxophone, Howard Klug was also the principal clarinetist of the Fresno Philharmonic, Bear Valley Festival Orchestra, Sinfonia da Camera and the Indianapolis Chamber Orchestra. He was also a member of the Columbus (OH) Symphony Orchestra and the Grant Park Symphony. Howard Klug has been a concerto soloist with the Fresno Philharmonic (on flute and clarinet), the Bear Valley Festival Orchestra, the Columbus Symphony Orchestra, Camerata Orchestra, Belgian Radio Orchestra and the Kamerorkest of the Staatsacademie of Vilnius. His extensive chamber music affiliations have included the Illinois Trio, the Illinois Woodwind Quintet, the Chicago Ensemble, Trio Indiana and fourte'. He regularly gives master classes in Vienna and London, as well as at the InterHarmony International Music Festival in Germany. 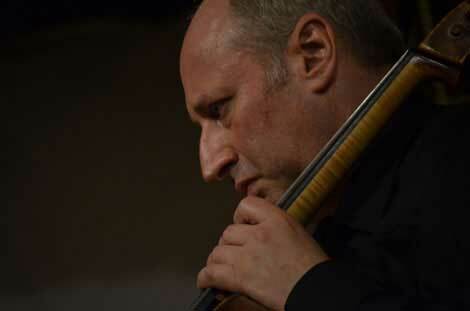 Originally from New Zealand, composer Nigel Keay today lives and works in Paris as a composer and violist. Throughout his musical career he has always been an active participant in presenting his own music either as a violist or on occasions as conductor. Before leaving New Zealand in 1998 Nigel Keay had held several fulltime composer-in-residence positions; the Mozart Fellowship in Dunedin, Nelson School of Music and the Auckland Philharmonia Orchestra. His music has been broadcast by Radio France and presented in concert by renowned musicians from France and elsewhere. In 2010 Nigel Keay was co-producer of the Blumlein Records CD Diversions - Autour du hautbois, A CD of music with oboe that included his own Diversions for Quintet. In December 2011 Blumlein Records released five of Nigel Keay's chamber music works on the CD Music for Small Groups. In October 2013 Nigel Keay was the featured guest on Radio France Musique's Tapage Nocturne programme. Born in Toulouse, France, Ms. Clarice Collins is a recipient of the Provost Scholarship and a sophomore violin student of Danwen Jiang at Arizona State University. Ms. Collins has given numerous public performances in Europe and the United States. She was a young artist participant in the 2013 InterHarmony International Music Festival in Germany, Conservatory Music in the Mountains Music Festival in Colorado, as well as the Harpa International Music Academy in Iceland, where she served as principal second violin for the festival orchestra. She has performed for the distinguished master classes of Russian violinist Dimitri Berlinsky, the Juilliard and St. Laurence String Quartets. Pianist Carson Hayes is currently a senior at the University of Tennessee, majoring in piano performance under the instruction of Dr. David Northington. His past teachers include Kathy Spaargaren and Dorothy Mahaffey. Carson has been an active music festival participant, attending the Sewannee Summer Music Festival, Tennessee Governor's School for the Arts, Indiana University Piano Academy, and the Interharmony International Music festival in Hinterzarten, Germany, and Italy. In 2013 He was selected as a winner of the University of Tennessee Concerto Competition, and played the first movement of Rachmaninoff's First Piano Concerto with the University of Tennessee Symphony Orchestra. Also, He was selected as the winner of the 2013 Tennessee MTNA Young Artist Piano Competition (the previous two years receiving honorable mention), and went on to be selected as the alternate in the Southern Division in January of 2014. Born in Beijing, Xiangyuan Huang began studying the violin at the age of five. Among many of her achievements, Ms. Huang is a First-Prize winner in the Youth Soloist Competition in Beijing. She has performed numerous concertos with the Beijing Sun Youth Symphony Orchestra at prestigious concert venues in China, including China Millennium Monument Concert Hall, Zhong Shan Concert Hall, and the China National Library Concert Hall. As a full scholarship recipient, she has attended the Performing Arts Institute of Wyoming Seminary in the United States, and the European Festival of Youth Orchestra in Spain for which she served as a Concertmaster. In 2013, she participated in the Sulzbach-Rosenberg International Music Festival in Germany as well as the Harpa International Music Academy in Iceland, where she was featured as a concerto soloist in the Vivaldi's Four Seasons in the festival's final Gala Concert. Currently, Ms. Huang is a sophomore, studying violin performance with professor Danwen Jiang at Arizona State University School of Music. She has performed in solo and chamber music master classes of Juilliard and St. Lawrence String Quartets, Charles Castleman and Carol Rodland. A native of Beijing, China, Shu Liu won first prize in the National Competition of Mozart Piano and Violin Works and gave debut performance at the prestigious Beijing Concert Hall, accompanied by the China National Symphony Orchestra at age thirteen. In 2009, she won Silver Medal in the national region of China's Excellent Violin Player competition. She has served as a concertmaster for the Beijing Youth Chamber Orchestra and Beijing Sun Youth Symphony Orchestra, and toured as a soloist and member of the orchestra across the country. Currently, Shu is pursuing a Bachelor of Music degree in violin performance at Arizona State University, under the guidance of professor Danwen Jiang. At ASU, she serves as a concertmaster for the ASU Symphony Orchestra. She has performed for the master classes of the St. Lawrence, Brentano and Juilliard String Quartets. 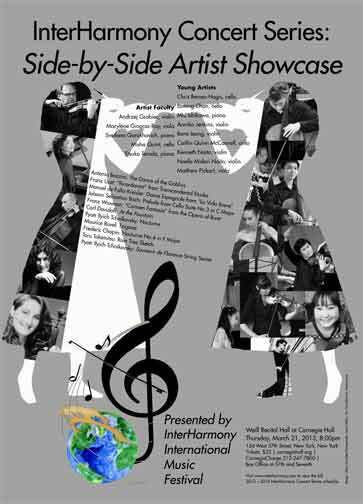 In 2012, she won second prize in the 2012 Tucson Symphony Orchestra Young Artist Competition. She was invited to attend the Sulzbach- Rosenberg International Music Festival in Germany in 2013, where she was featured as a soloist and chamber music performer in the Prize-Winning Student Recitals, and received critical acclaims by critics and audiences alike. In January 2014, she won the Southwest Division of MTNA Young Artist Competition.